Zambia : Luapula Chiefs Council refutes media reports that they are against Davies Mwila as PF SG. Luapula Chiefs Council refutes media reports that they are against Davies Mwila as PF SG. Luapula Provincial Council of Chiefs has refuted media reports that they advised President Lungu to drop his Secretary General of the Party because he lost his election in Chipili and he is not a man of the people. 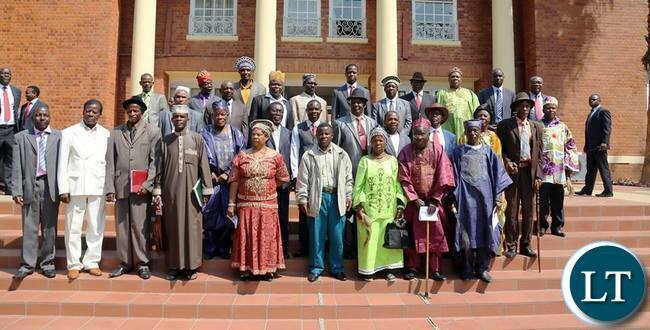 Speaking on behalf of the Provincial Council in Mansa, Chief Chisunka said the meeting with the President when he came for a three days working visit to the Province was based on developmental programmes for the province and the welfare of Chiefs. He said there was nothing political in the meeting with the Head of State except to thank the President for appointing seven members of Parliament from Luapula and one nominated as Ministers in his administration including Davies Mwila as Secretary General of the Party. Chief Chisunka implored the Media to be ethical in doing their work and stop dragging traditional leaders into political arguments. The Chief observed that such reports could only brood enmity between the traditional leaders and the politicians which is not in the interest of nation building. Luapula Province Permanent Secretary Dr.Buleti Nsemukila said he was equally surprised with the media report. Those whom President Lungu has appointed in his Cabinet from Luapula are Community Development and Social welfare Minister Emerine Kabanshi from Luapula Constituency in Lunga District, Health Minister Dr. Chitalu Chilufya from Mansa Central Constituency and Foreign Affairs Minister Harry Kalaba from Bahati Constituency. Others are General Education Minister Dr. Dennis Wanchinga from Mambilima Constituency, Energy Minister David Mabumba from Mwense Central Constituency and Infrastructure Development and Housing Minister Ronald Chitotela from Pambashe Constituency. The President included Luapula Province Minister Nixon Chilangwa from Kawambwa Central Constituency and nominated Davies Chama as Defence Minister from Kawambwa. President Lungu in the Party appointed Davies Mwila of Chipili District as Secretary General of the Party which is a third position in the Party hierarchy. These are the appointments which have made the traditional leaders in Luapula Province grateful to President Lungu because it is a rare opportunity to have such a number from one province in the Cabinet and Party structure which should put up a united front for the development of Luapula as currently it is the poorest Province in Zambia and its poverty stands at 82 per cent. Good observation by Luapula chiefs- that’s the way to go! @Saulosi, am disappointed with Luapula PF ministers, they are overpowered by MMD ministers. Ululumbi lwa mulanda kukakata. Kabanshi is so quiet these days ulya mayo. I still don’t believe Luapula is poorest. So this NEZ is trying to imitate Mushota? Sorry Mr Nez, Ms Mushota is in a class of her own and the sooner you accept your inferiority the better for you. Its not the media but as usual IT WAS FRED M’MEMBE’S PAPER THE MAST WHO LIED ABOUT MR DAVIS MWILA!! !i wonder where M’membe’s workers did their journalism of lies! !His papers write about rumours,opinions from finished politicians such as Mike Mulongoti,HH,Mucheleka,Guy Scott,etc.thank God that their lies against PF are always exposed! !ECL has God’s favour so no weapon formed against him and his PF will prosper!! !TO NEZ-SURELY WHO CARES THAT YOU ARE VISITING IN THE UK?IT SIMPLY SHOWS HOW DULL YOU ARE BECAUSE ONLY A VILLAGER GETS EXCITED UPON VISITING ANY TOWN!! I love the photo, my people! One day I will visit. No wonder Trump is trampling on some media though this is not justifiable.